On September 11, 2001, the unthinkable happened-the United States of America was attacked mercilessly, without warning, by then unnamed terrorists. The World Trade Center's twin towers and the Pentagon, iconographic buildings in the hearts and minds of Americans, were devastated from a clear blue sky. This second "Day of Infamy" struck at the heart of the United States and changed the outlook of the Free World forever. Within minutes the inferno was identified as a merciless attack by international terrorism against America and her allies. Shock and disbelief reverberated around the world as the death toll rose and the awful implications of the outrage became clear. How would the newly inaugurated President George W. Bush cope with this tragedy? What could he do to collect the stunned nation and guide America through this calamity? How would the world change? It became quickly apparent-through the words and actions of foreign world leaders of all political persuasions-that the attack revolted all decent-minded people. Uniquely, America and her allies united as one against the terrorist attack. Their words show their cohesion in their measured, reasoned, but implacable response. Such outrage had no commonality with any government or peoples. The terrorists would not succeed and could be certain that they would be hunted down to their lairs-where ever they hid. 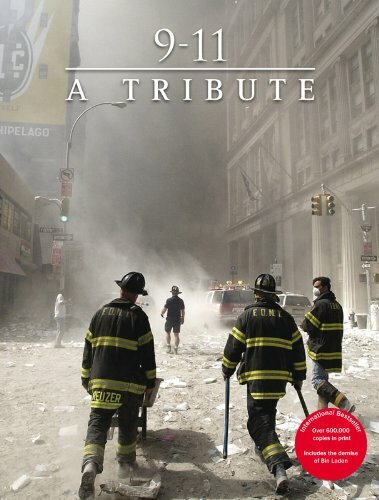 This book is a tribute to the people who lost their lives on September 11-they will not be forgotten. It is a salute to the matchless courage of the public servants-the policemen and firefighters-who selflessly laid their lives on the line to help others, and died trying to save their fellow men. These men and women epitomized the indomitable spirit and courage of a nation forged in freedom, showing that the United States would not succumb to violence and terror but instead rebuild stronger than ever and take the war to its enemies. The key leaders-Bush, Blair, Gulliani-showed their best in this time of trouble providing comfort, inspiration, and leadership. As good as his word, President Bush has led the world to the door of the Taliban, the evil government of Afghanistan that harbored and succored the terrorists, Osama bin Laden and his cohorts. Over 300 fantastic photos from the archives of the Press Association, together with the actual words of the principal players and world leaders as they reacted to unfolding events, make this a comprehensive and compelling document of the events. The epilogue contains the address of President Barack H Obama announcing the covert military action that resulted in the demise of terrorist leader Osama Bin Laden. About Jan Stradling (Author) : Jan Stradling is a published author of children's books. A published credit of Jan Stradling is The Wonders Inside: The Human Body.